Tucked between the protruding formations of the Salathé Wall and Lurking Fear, Aquarian Wall and Never Never Land offer fun and secluded adventure. 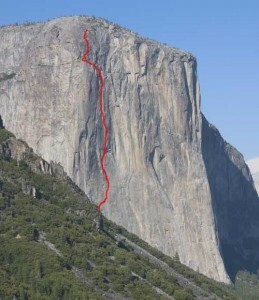 Aquarian Wall is known for its excellent location, plush bivy ledge and moderate difficulty. It’s about as challenging as The Shield or North America Wall. Which SuperTopo guidebooks include a topo for Aquarian Wall?